The Sitka Gear Celsius is the whitetailer's puffy jacket. But instead of the crinkly fabrics found in most technical insulators, its baffles of PrimaLoft Silver Hi Loft Insulation are sheathed in an ultraquiet, durable Micro-Fleece. It's ideal as a mid layer, but you can also use it as an outer layer, letting you stack and shed to keep pace with the Midwest weather. 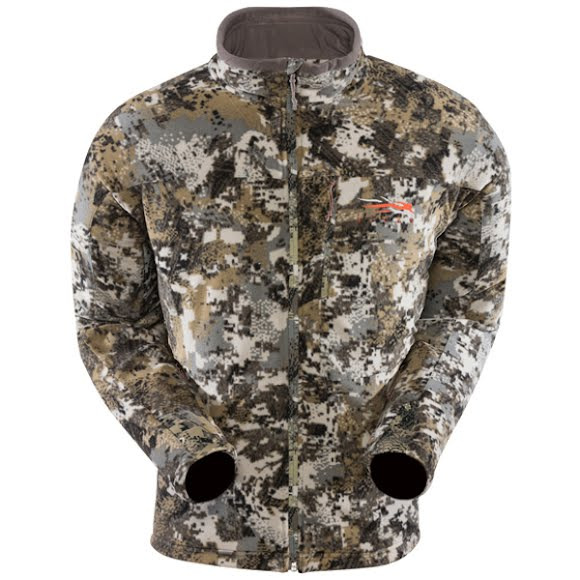 The Sitka Gear Celsius is the whitetailer&apos;s puffy jacket. But instead of the crinkly fabrics found in most technical insulators, its baffles of PrimaLoft Silver Hi Loft Insulation are sheathed in an ultraquiet, durable Micro-Fleece. It&apos;s ideal as a mid layer, but you can also use it as an outer layer, letting you stack and shed to keep pace with the Midwest weather. I've only had mine for about a week and could not be happier. I went up one size and it fits like a glove, with enough room inside to layer with a good base layer. Large size for me at 150# and 5'10"... As comfortable as anything I have ever worn, and is quieter than any other hunting clothing I have ever purchased. And I am very very particular about my hunting clothing and avoiding noise is priority 1... I got mine in Elevated II and testing proves extended effective range is awesome in different types of cover, and different types of lighting conditions. As of yet I don't know about resilience, or durability of this jacket as an outer layer. But most of the time this will be a mid layer in extremely cold conditions. I have worn it around outside the last few mornings at around 35° and it is very warm over a tee shirt. I could not be more satisfied. Kudos to Sitka for this jacket. I have avoided buying Sitka gear as it is more expensive than other brands, but with a gift card from a friend, I decided to try this jacket. Now I see why serious hunters like Sitka gear. Very light weight and quite warm. I even wear inside in the mornings while the house heats up. Not sure how water resistant this is, but will find out this spring while watching grandchildren playing soccer.